Alfe Kim - WELCOME TO SG DRUM ACADEMY - THE ACADEMY FOR DRUM LESSONS, MASTERCLASSES, CLINICS AND BOOKS. 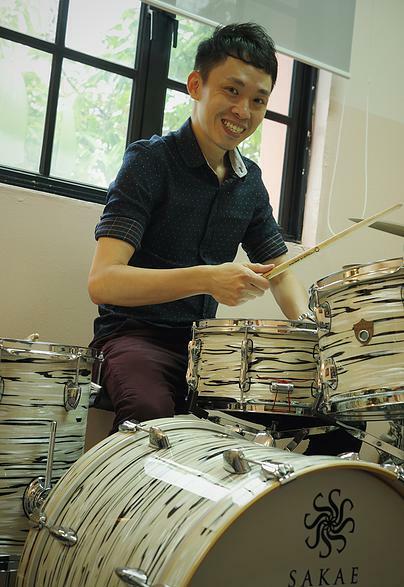 Alfe is considered as one of the top comtemporary drummers in Singapore and he has the passion, desire and abilities to coach any potential drummers into top musicians. He's well versed in many styles of music and he has two decades of experience for teaching. Alfe has been active in performing and in drumming education over the last 2 decades. In recent years, he has been focused on growing the next generation of drummers & drumming educators in Singapore. Through his passion and belief, he has applied his music voice and skill across the varied and vibrant music communities of Singapore, regardless of language and music genre, from the indie to the commercial, and from the contemporary to the underground. ​From 1998 - 2002, he was a member of 'Livonia', an alternative rock band which scored a string of radio hit singles such as "Zerofeel", "Let Go" and "Vengeance Is Mine" and was the recipient of Compass's Top English Pop Song 2000. As a session drummer, Alfe has performed around the world including the UK, France, South Korea, Hong Kong, Malaysia, Thailand, Hong Kong, Taiwan and China. He has worked with Top 40s band AlterEgo, Jazz groups such as Havana Brown, The Broke Quartet, Rock Instrumentalist Shern Wong, local metal bands La’Dies, Opposition Party and alternative rock band En-X. A pioneer of the Singapore J-rock scene, Alfe’s current & former students include Vics (Lucify), Jun (Ethe'real), Geist (LivEvil) & Ridzwan (Aries Kaizer) and he has supported & mentored local J-rock groups including Deathopia, Yi Xuan Feng & GeneXis. Alfe was appointed a Mentor to provide guidance to youth music groups at People’s Association events Youth Music Fiesta 2009 and Singapore Music Camp 2010. He was also a founding member and chairman of 'Drum Xchange Singapore', a non-profit group that brings drummers together in the spirit of drum knowledge sharing and community-building. Currently Alfe performs weekly with his bilingual music group Too Much Drama at Switch, a partnership between Timbre Music Group & NTUC. Alfe endorses Sakae Drums, Powergear Drumsticks and documents his music life on the go with Samsung digital cameras.